Vinyl flooring has been around since the 1930’s, but lately, it has had a resurgence making it an immensely popular style again. It’s a type of resilient flooring that comes in the form of sheets. Installing vinyl flooring doesn’t require a lot of tools or complicated instructions making the process much easier than if you were to install tile or wood. This is an investment that would make any frugal homeowner reconsider what kind of flooring to install. Vinyl flooring is popular for several reasons. The material itself is essentially polymerized plastic. Therefore, it is very affordable for those trying to save money. Vinyl flooring is also exceedingly durable mainly due to the fact that it absorbs upon contact. No matter how much you stretch or bend this material, it always returns to its original shape. Homeowners usually enjoy the fact that they can drop heavy items on the floor and they never see so much as a dent. This is great for home owners that have a lot of foot traffic in their residences. Another reason it became so popular is that it doesn’t make any sound when you step on it. In homes with hardwood floorings, you may hear occasional squeaking. And with tiles, you usually hear footsteps. 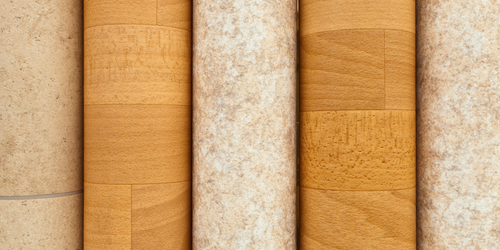 Interestingly, vinyl flooring is a sound absorbent material so parents won’t hear their kids running around the house. Some people enjoy the peace of mind that they get from a quieter home. Another benefit of vinyl is that it is fire-resistant, so there is no need to worry about pesky fires ruining your floor. Lastly, installing vinyl flooring only takes a couple of minutes. It’s so easy that homeowners usually do it themselves. All you do is add adhesive to the bottom of the sheet and simply roll it out on the floor. Vinyl is a very versatile material. Manufacturers use this same material to make golf balls, records, soles of shoes and piping. During the 1960’s, as technology advanced, so did vinyl flooring. Designs became more complex and manufacturers learned to give vinyl the same appearance as tiles. You can order vinyl in just about any style; checkered or striped. In the 1970’s, it was discovered that you could cut vinyl into planks, giving them the appearance of wood. Homeowners loved the fact that they could purchase flooring that looked just like wood but with all the benefits of vinyl. Not only does this material have all the usual benefits mentioned before, but it’s also water-resistant too. Installing vinyl flooring in this design is as simple lining up the planks and using adhesive to bond them to the floor, making this an easy pet project. There aren’t many disadvantages to using vinyl as your flooring. One complaint that individuals have is that while vinyl flooring is water-resistant, it is not always stain-resistant. However, this only happens if you leave liquids on the material for a long period of time or if your residence has experienced a flood. Liquids may seep into the fibers of the plastic and cause discoloration. However, you can simply replace the stained section instead of replacing the entire flooring. Just remove the plank or affected tiles and replace it with tiles ordered from the same manufacturer. Another issue is that customers often want to use bleach products or ammonia to clean the floor. This is not advised because the chemicals could damage the material and cause discoloration. It is suggested that individuals use floor cleaners recommended by the manufacturer. Otherwise, the floor only needs to be swept or vacuumed. You can mop the floor, however, you should only do this occasionally so as to prevent staining. If you’re thinking about installing vinyl flooring, however, you’re worried about removing your old flooring, give us a call at DustBusters. We offer residential and commercial floor removal services at competitive prices. Additionally, we utilize industrial vacuums during the floor removal process because we are committed to providing customers with a dust-free environment. Give us a call at 866-883 for more information or email us at service@dustbustersfl.com.